This is the ArCHomesData page. Here, you can download the ArCH Energy Values/ Data Page, for use on your project. ArCH is making this FREE to everyone, everywhere, effective immediately. Terms of Service are that you will use the form, as-is without making any changes to the form, except for entering data in the blanks. IECC requires that energy values be posted on all projects (2015 IECC R401.3 CERTIFICATE). This is mandatory. 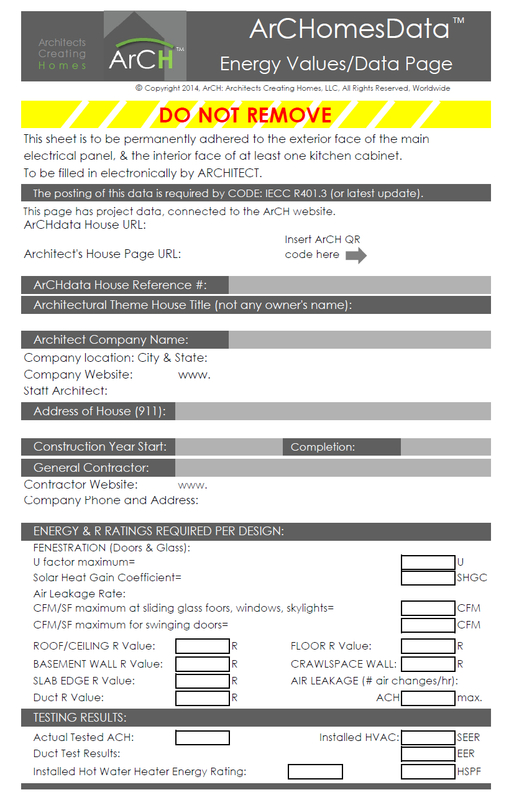 This ArCH form is one of the first data sheets to do in both jobsite paper and electronically and to provide other valuable information about your project. Encourage everyone to use this handsome ArCH form. It is to be printed on a white adhesive 8-1/2 x 11 piece of paper and posted the exterior of the main electrical panel of the project, and inside the door face of at least one kitchen cabinet. It is suggested that you use this firm in combination with the new ArCHspec, which integrates it into the Division 7 Energy Section of the Specifications. It is intended that the Architect fill out this form electronically, save as a PDF, then make this available to the Contractor for posting on the actual, physical, built project. The ArCHspec has instructions for this, and a place for the URL for the form to be posted by you, as part of the CDs (Construction Documents). This form manages the posting of energy values better than anything else before and in a handsome graphic design, boldly posting the ArCH brand. Use it on all of your projects. As a secondary option, if you would like to establish a project page on the ArCH website for your project, ArCH can do that for you, assuming that you are an ArCH member. Charge for members: $199/ project page. ArCH will create your blank page, give you a password, then you will be in charge of entering data for your project. You will also need to create and paste the QR code for this page for your project, which will allow future people at the house to use their Smart Phone to scan the QR code to call up your ArCH project page with information about your project and your firm. Click here: to go to the ArCHstore –> ArCH Member Project Page Order.